In 2010, venerable Canadian experimental imprint Constellation Records released Musique Fragile Volume 1, a triple vinyl box containing three like-minded drone records. Among them was Brûlez ce coeur, an album from Montreal's Les Momies De Palerme. Now, that record is seeing its own individual release via the label. 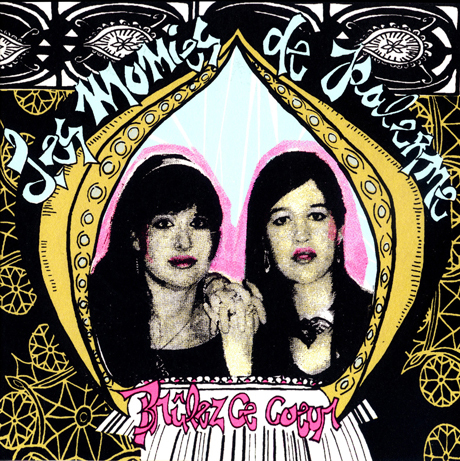 For the uninitiated, Les Momies De Palerme is a duo composed of Marie Davidson and Xarah Dion. Dion first contacted Constellation as a mail-order customer but soon developed a stronger bond with both the label and Montreal's larger music scene. Both members of the duo now play double duty in Sam Shalabi's Land of Kush, along with running the DIY performance space La Brique. Brûlez ce coeur is the group's debut album. It features guest appearances from Shalabi, along with producer David Bryant, who has also worked with Godspeed You! Black Emperor and Set Fire to Flames. The album features processed synths, violins and vocals. As the label puts it, it's "often like an ersatz sacred music: canticles on acid, full of strange quirks and avant sounds while remaining soothing, meditative and incantatory." Brûlez ce coeur will be available as a vinyl, CD or digital release on April 3. The full album can be streamed below.